Poor communities often preserve a wisdom rooted in the Gospel that’s sometimes lost on the affluent, veteran journalist John Allen told the Australian Catholic Bishops Conference in a recent interview. Allen will visit Australia next year to deliver an address at a mission conference for Catholic Social Services in Australia from 24 – 26 February 2016. The Pope is calling for a Church that is poor and stands with the poor, that gets personal and goes beyond traditional forms of social engagement. Asked what new directions could be considered by Catholic Social Services, Allen says, ‘For one thing, making sure that the voices of the poor are heard. During his recent trip to Africa, Francis visited a slum in Kenya and insisted that the poor must be more than objects of charity, however well intentioned’. Pope Francis has repeatedly condemned the ‘globalisation of indifference’. But in terms of the mission of Catholic Social Services, Allen says, ‘I don’t think Francis is calling them in a different direction so much as asking them to redouble their commitment, and raising their profile as a defining activity of the Church. He wants a Church that reaches out to the peripheries of the world, and our charitable agencies are often the leading edge of that effort’. When asked to describe Pope Francis in five words, he gave us four, ‘The Pope of Mercy’. The Holy Father’s call to draw near to new forms of poverty and vulnerability is ‘a Gospel principle’, and in truth, ‘all recent popes have emphasised the importance of the option for the poor. What Francis brings isn’t a new teaching but rather a powerful biographical and personal passion, which translates into credibility’. Allen initially trained as a high school teacher and it was only by chance, teaching a journalism class and envying the kids, that he entered journalism. ‘I started freelancing just to pay the bills and I got hooked.’ His degree in religion led him to pitch articles to the National Catholic Reporter. ‘Fairly quickly they hired me, a couple of years later they shipped me off to Rome, and the rest is history. 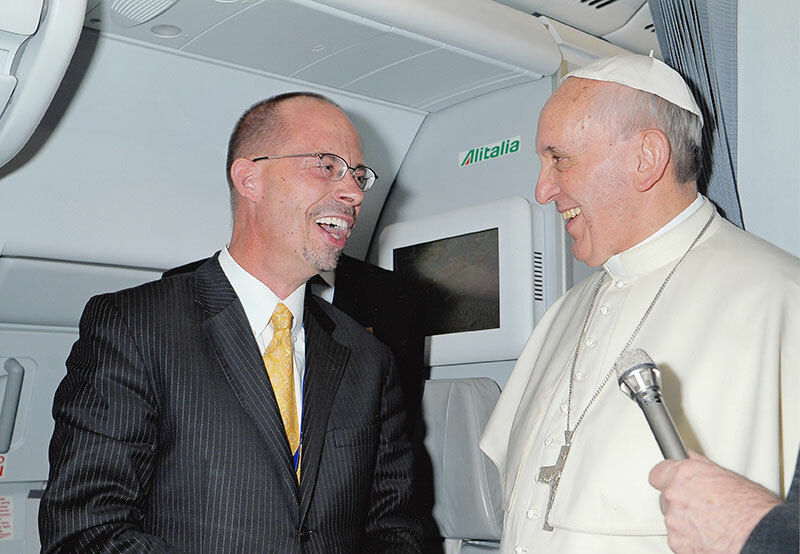 As Vatican Correspondent for Crux, an online news platform, Allen has the privilege and task of travelling with the Holy Father on overseas visits. 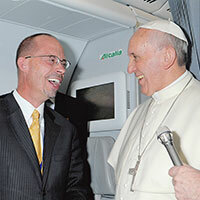 ‘I always think a pope’s first trip tends to set the tone for all the others,’ Allen says. The visit to Brazil in July 2013 remains ‘foundational’. Pope Francis added two items to the itinerary he had inherited from Benedict XVI, ‘a visit to a favela, the Brazilian word for a slum, and to the Marian sanctuary at Aparecida. Understand those two things about Francis – his passion for the poor, and his devotion to the Madonna – and you’ll be a long way towards understanding his papacy’. Commenting on the recent Synods, Allen says, ‘the two synods revealed consensus on some issues, such as the need for more thorough marriage preparation, but also deep division on certain hot-button questions: Communion for the divorced and civilly remarried, for instance, or “new language” on homosexuality’. It showed a church that ‘isn’t afraid to wrestle with tough questions’, however the challenge is ‘to maintain a spirit of common cause as the pope begins to act on what he heard’. 2015 will be remembered for the publication of Pope Francis’ encyclical Laudato Si’. Allen says, ‘Francis clearly has become the face and voice of moral support for strong environmental protection, and he’s got the attention of the political world. Candidates in the 2016 US elections, for instance, are now routinely being asked to respond to the pope’s positions, especially in the wake of his recent visit to the country. Referring to the C9 personalities – the nine cardinals in the pope’s top advisory group – Allen notes that these are not ‘yes men’ and ‘hardly think alike on everything’. It’s no surprise that ‘Francis was astute in ensuring that he wouldn’t be hearing just from one side of the street’. Allen added that ‘the C9 has revolutionised Vatican operations, in the sense that it’s no longer Roman bureaucrats making the decisions that really matter but rather these cardinals representing local churches around the world’. Asked about the current reforms in the Vatican, Allen believes that the jury is still out in terms of whether the current reforms will succeed. ‘Bear in mind that there were attempted reforms under both Pope Paul VI and St. John Paul II, and neither really had the desired effect’. One test will come when the Secretariat for the Economy team release the Vatican’s next annual financial statement, ‘if it’s more informative, clearly independently certified, and reflects greater fiscal achievement, then we’ll know things are moving in the right direction’. With the restructure of the Vatican communications unit, Allen says that he’ll take a ‘wait and see’ stance about the new structures because experience has taught him to be sceptical of bureaucratic solutions to communications challenges. More broadly, Allen believes the impact of digital media in the Church is ‘a mixed bag’. He acknowledges that new voices can emerge but in some cases the voices, or the technology, can exacerbate divisions. What Allen would like to see going forward is ‘a spirituality of digital communication that would include a strong emphasis on fostering a hermeneutics of charity’.